Philadelphia, PA – June 29, 2016 – Janney Montgomery Scott LLC announced today that Anne Lurton has been promoted to Senior Vice President and Complex Manager for the firm’s Washington DC Complex which includes offices in Washington DC and Alexandria, Va. She replaces Jeff Smith who was recently promoted to Head of Recruiting and Business Development for Janney’s Private Client Group at its headquarters in Philadelphia, Pa. Lurton was previously Assistant Complex Manager for the Washington DC Complex. 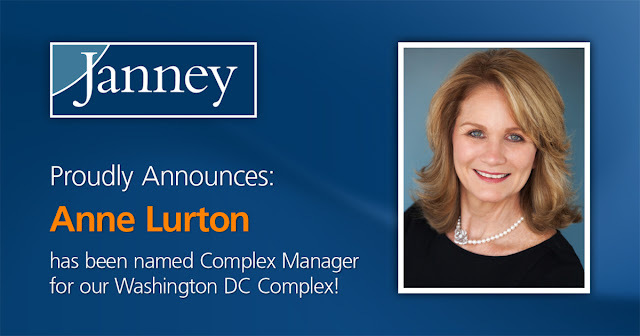 In this role, Lurton will be responsible for the overall success and growth of the Washington DC Complex including the recruiting of financial advisors and other financial services professionals, organic growth, business development, and enhancing Janney’s community engagement in the greater DC market. The Complex currently has 22 Financial Advisors who oversee $1.9 billion in client assets. Lurton’s career at Janney spans 25 years where she has held various Private Client Group roles. In addition to her responsibilities locally in the greater DC area, Lurton has led the onboarding and transition process for multiple Financial Advisors and office openings in locations across Janney’s footprint. Lurton serves as Chairperson of Janney's Branch Operations Leadership Council, is a member of the Communications Committee for Janney’s Women’s Interactive Network and has been recognized for her superior client service with the Private Client Group Meritorious Service Award. She holds FINRA Series 7, 8, 63, and 65 licenses. She will be based out of the firm’s Washington DC office.